Jeannette Miller is an historian of modern France. 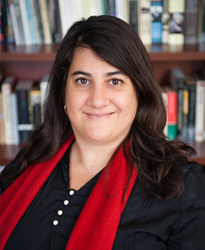 Her research focuses on the impact of post-imperial migration from Algeria to France on society, political structures, and cultures in France and Algeria. She taught French language, French and Francophone cultures, and French colonial history and immigration courses at Penn State University, the Institute for American Universities in France, and Goucher College. She was the recipient of a Fulbright Advanced Student Award and an NEH Summer Scholar Award. Kathleen M. Barry is an historian of the twentieth-century United States whose research has focused on women and labor. She is the author of Femininity in Flight: A History of Flight Attendants (Duke University Press, 2007). Her doctoral work was supported by an AAUW American Dissertation Fellowship. She has taught US history at New York University and the University of Cambridge, where she was the Mellon Research Fellow in American History and a fellow of Jesus College for three years. After her postdoctoral fellowship in Cambridge, she remained overseas, living in England and Spain for a total of 11 years. Along with her time in academia, Barry has also worked in public history institutions. She served on the staff of the Gilder Lehrman Institute of American History, developing publications and programs, and was the Executive Director of the Historical Society of Baltimore County.